Immigrants across the country are showing that America can’t run without immigrants. 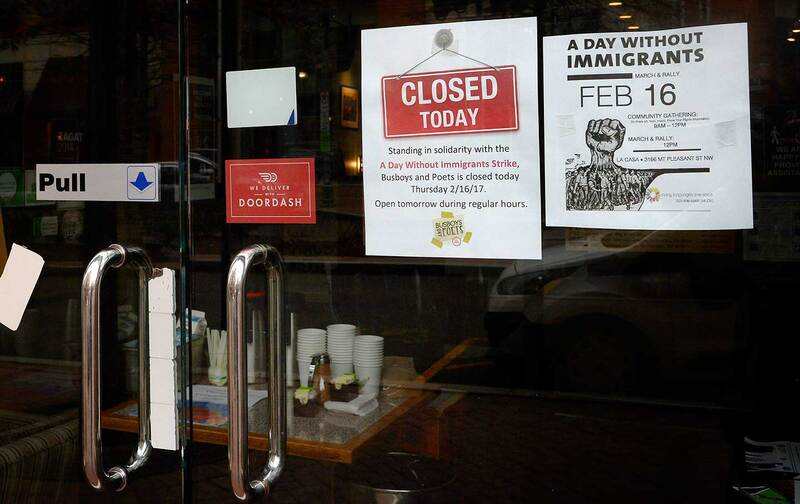 On Thursday, immigrants across the country have pledged to remove themselves from their public lives for a day in a action that’s being called “A Day Without Immigrants.” In other words, immigrants are hoping to give Donald Trump a taste of exactly what he wants. And by making their absence known, remind the country of their vital role in their communities. “The ask has been: Stay home, don’t shop, don’t go to work, and don’t send your kids to school,” said Erika Almiron, the executive director of Juntos, a Philadelphia-based immigrant rights organizing group. It’s unclear how many people will participate today, and the action seems to have spread organically without much coordinated planning through social media. Restaurant industry leaders, dependent as they are on immigrant labor, have been the most public supporters of the action. The celebrity chef José Andrés will shut down five of his Washington, DC, restaurants to support his staff. At least five Philadelphia restaurateurs have pledged to support their workers. Restaurants in Austin, Denver, and New York have also announced that they’ll be supporting workers, either by shutting down or by capping reservations to support workers who stay home. And it’s not just the high end. In Los Angeles, the beloved Leo’s Taco Truck announced this week that it would also shut down all of its locations for the day. Thursday’s day of action follows a similar one organized by thousands of immigrants and their allies across Wisconsin on Monday. The protests are a response to the Trump administration’s sweeping immigration crackdowns and the alarming raids that Immigration and Customs Enforcement has pursued in the last week. Last week ICE arrested nearly 700 people in an aggressive campaign that spanned the entire country. Among them was Daniel Ramirez Medina, a 23-year-old undocumented immigrant with purported protection from deportation. He is a recipient of a 2012 initiative by President Obama called Deferred Action for Childhood Arrivals, or DACA, which grants him short-term protection from deportation and a work permit. Ramirez was at home on Friday when ICE agents knocked on his family’s door intending to arrest his father, his attorneys said. They took Ramirez in too, despite the fact that he told them about his DACA status. He is still being detained in a Washington detention facility. Ramirez’s arrest is the first public case of a DACA recipient’s being arrested and detained by ICE, and represents an important glimpse at how the Trump administration intends to carry out its immigration enforcement agenda. Dreamers, as DACA recipients are often called, by virtue of being young and having cultivated a public reputation for being ambitious, dedicated strivers, are widely understood to be the most publicly sympathetic undocumented immigrants. To even receive their two-year deportation deferrals, they must clear extensive background checks, have squeaky-clean backgrounds, and clear a host of financial and bureaucratic hurdles. Indeed, the Department of Homeland Security “has twice determined that Mr. Ramirez poses no threat to national security or public safety,” his lawyers argued in a petition for his release. ICE has since called Ramirez a “self-admitted gang member,” as a defense for their arrest. Ramirez has no criminal record, his attorney says. But that may not count for much in the Trump administration. Embedded in Trump’s executive order laying out whom among the nation’s 11 million undocumented immigrants he wants ICE to pursue for removal, Trump named those who have been convicted of a crime, as well as those who have not been convicted of anything but merely been charged with a crime, and those who “have committed acts that constitute a chargeable criminal offense.” Or, in other words, those who have never been charged with any crime at all but merely committed an act that could be considered criminal. In case that net isn’t wide enough, Trump also directed ICE to pursue those who “in the judgment of an immigration officer, otherwise pose a risk to public safety or national security,” which could also be interpreted as: anyone an immigration agent feels like arresting. And Ramirez isn’t the only alarming case. ICE agents arrested a woman at an El Paso County Courthouse last week who was there petitioning for a protective order and who had reported domestic abuse. The tip about her identity and whereabouts allegedly came from her abuser, the El Paso Times reported. ICE also reportedly seized upon men just as they were leaving an Alexandria, Virginia, church last week, NBC reported. These kinds of arrests violate longstanding norms based not on law but on decency: that ICE will not conduct its enforcement around schools and churches, the most sacred places in a community. Those old norms may be no good now. These are the days that immigrants are living through right now. Trying to piece together what exactly punitive Trump’s executive orders will look like in practice in real time as ICE is descending on neighborhoods and knocking on doors has shaken people into a state of terror. In Jackson, Mississippi, a woman reportedly barricaded herself in her home after two other members of her family were arrested last week, the Clarion-Ledger reported on Wednesday. She, like Ramirez in Seattle, has DACA. Technically, she should not fear leaving her home. But after a week like the one that’s just passed, ICE has shown that just about anyone can be swept up, no matter their background, no matter their circumstance, no matter their location. On Thursday, immigrants hope to turn that fear and panic into a political message and show the nation that, if Trump were to really get what he wanted, the country would be a very different place.